← Oh yeah, it’s Primates Night! Doing a little research for a future episode of Marvel CounterPoint, I noticed that the design of many of the Marvel U.’s robotic characters of the 60s included skirts and other elements to obscure the “crotchal region.” It’s all well and good for Giant Man to wear a Speedo, but it would simply not do to subject the readers to the horrors of a metallic bulge. 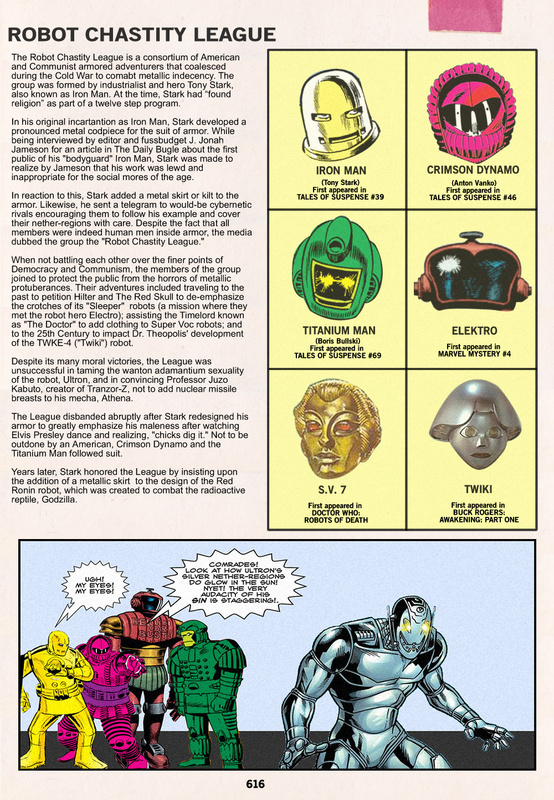 So, doing a little research, I found this “lost” page from the second edition of “The Official Handbook of the Marvel Universe.” * Click the image for an embiggened version. * Nah. I just made it up. This entry was posted in Comic Book Humor, Comic Books, Marvel Comics and tagged Buck Rogers, Comics, Crimson Dynamo, Doctor Who, Iron Man, Marvel, OHOTMU, Robots of Death, Titanium Man, Twiki. Bookmark the permalink.